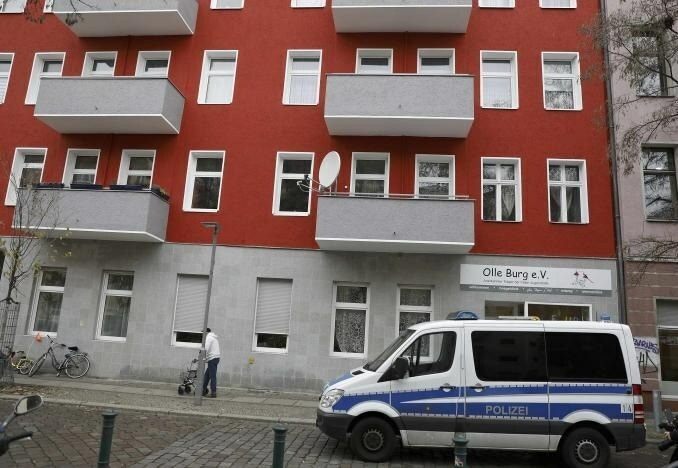 Police launched dawn raids on about 190 mosques, flats and offices linked to an Islamist group in Germany on Tuesday as the government banned the organisation, accusing it of radicalising youngsters, the interior ministry said. Interior Minister Thomas de Maiziere said the DWR 'True Religion' organisation had contacted young people as it distributed copies of the Holy Quran and other religious material, and had persuaded about 140 of them to join militants in Iraq and Syria. DWR made no reference to the raids on its website and did not immediately respond to a request for comment. German Chancellor Angela Merkel has faced pressure to harden her line on security after a string of attacks claimed by Islamic State across Europe and criticism of her decision to let in about 900,000 migrants last year. "Today's ban is not directed against the distribution of the Quran or translations of the Quran," de Maiziere told reporters. He added, "Today's ban is rather directed against the abuse of religion by people propagating extremist ideologies and supporting terrorist organisations under the pretext of Islam." The group had several hundred members, he said. 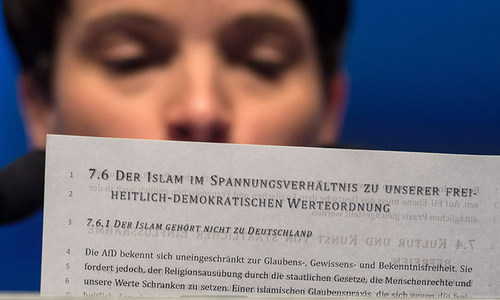 Concern over the number of migrants entering the country has boosted support for Alternative for Germany, a populist party that says Islam is incompatible with the German constitution and has siphoned off support from Merkel's conservatives. The ban means DWR is now prohibited from taking part in information and distribution campaigns. De Maiziere said Tuesday's actions across 10 German states were the biggest crackdown on a group since the government shut down a movement known as Kalifatstaat (Caliphate State) in 2001, accusing it of "extremist activities". The government has also banned five other organisation accused of having Islamist-Jihadist aspirations since 2012. Dont know the ground realities but this action is going to add fuel to the fire. Muslims in Western countries are misusing the hospitality of the host nations. All muslims are free to pursue their faith in whatever they believe, in their own mosques and in some case religious schools. Unfortunately, a small minority of so called muslims are involved in activities which is against the local laws. Just imagine christians coming to muslim countries and get the same religious freedom and treatment-unthinkable. Just in 2015 close to 2 million refugees were taken by these countries. How many muslims brothers and sisters from war torn countries were taken by the rich muslim countries in Middle East and elsewhere? We can learn a lot from Western countries what humanity and kindness means. Hope that these unguided muslims will learn how to behave and follow the law in countries where they have found new homes. @Explorer001 : it will never happen until the silent majority of Muslims openly come out against this! This is never seen anywhere in the world. German authorities must not target innocent Muslims. This is due to the pressure of right wing in Germany. Merkel must not turn into Donald Trump in future. This type of action was accepted by German authorities followed by other countries in Europe and USA. Good decision for the future of Germany. The same needs to be done back home to known madrasahs teaching violence. Very sensible and timely action by efficient German authorities to protect people living in germany. Pakistan must learn from Germany. @amalia Please do some research and you will find out that the middle eastern governments and Turkey have taken in a lot of refugees. Ch. Nisar, this is what banned means. @amalia If you are silent against extremism then you are not innocent. Why is it that we go to a foreign country and now all of a sudden we want to change its government into our system? We failed to do the same back home. We should follow an agenda of improving society through honest effort, introspection, being the best citizens, being honest to a fault, and being just. We have never created an example of an exemplary life. We just wait to be governors. And Ch. Nisar allow ban organisation to hold rally in Capital. This is all politics to woo the right wing. No doubt terriorists are an issue, But Ms Angela has realised that the current mood of the world and nation is to be a bit on the right,and be more nationalistic. 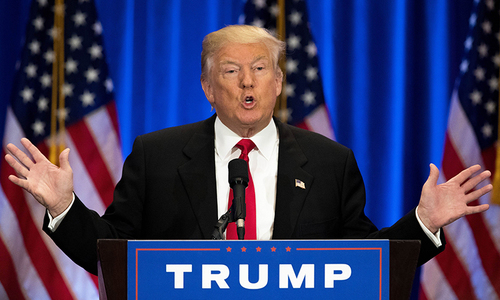 Brexit and Trump victory has set the pattern . As a Muslim, I endorse the action by the German police. Muslim countries also need some courage to curb down the activities of these banned extremist groups. @Explorer001 Turkey, Pakistan, Egypt, Jordan have taken quite a lot more than they're given credit for. I don't understand that when some small groups are giving bad name to the whole Muslim Umma, why can't all Muslims get together and defeat them. @Unshackle Pakistan , What a joke? Turkey is responsible for the refugee problems from Syria. @Satnam I think it's time for us to denounce extremist and boycott that mosques in which such people spread their hate against other people. @Waqas Middle Easter governments have not taken any refugees. Only Turkey but that is a passage way to Europe, and that is also because European nations have been giving billions to Turkey for doing this work. To my knowledge, Turkey has not granted political asylum to any Syrian refugee. @amalia It is very clear from the news article that Germans have acted against the criminals and not against any innocent Muslims and most of the readers here are in support of this action including myself. @lafanga It is not the spread of Islam that is being obstructed by the Western governments. In all truth Western governments have forever provided great, open and equal opportunities to all religions to further, propound and propagate their message not only to their own ilk but also to the natives. This openness and forward thinking is unmatched by any other countries of the world and that is the reason why Islam has succeeded in converting so many of the local populations. I live in one of these Western countries and I owe them a deep gratitude for the absolute freedom to practice my faith and stick to my foreign culture without ever suffering any discrimination, disadvantage or slight. We as immigrants need to show some appreciation for the generosity and love given us here which we rarely see back home. @Waqas please enlighten us a bit more by naming those Middle Estern countries that have taken immigrants on their soil. 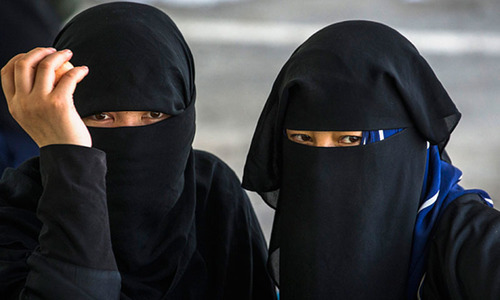 Muslims in Germany and Europe MUST work for their economic betterment, educating their children and in the process helping their host countries in form of tax payments. Terrorism is a dead end and is destroying the future for all Muslims in Europe which has a long painful history of retaliating against percieved enemy groups. @Explorer001 I couldn't agree more. The bottom line is that fewer Muslims will be invited to live in Germany. @Explorer001 Spot on brother. Very articulately put. @Ravi bancouver He completely did not mean that, you completely misread him, his mentality is the reason Germany is taking this extreme action. I do not know the situation on Germany. But Germany has been more than accommodating to other muslim refugees and I think they every right to make sure that likes of ISS are not among peaceful Muslim practicing their religion in that country. Right decision to keep local citizen safe. Safety of citizens must be top priority. In new world you never know, keep certain types out. Well written. Highly logical statements!! Why do extremists want to give muslims a bad name everywhere? @Waqas interesting.. Since you seem to have done the analysis, probably you can shed light on the numbers.